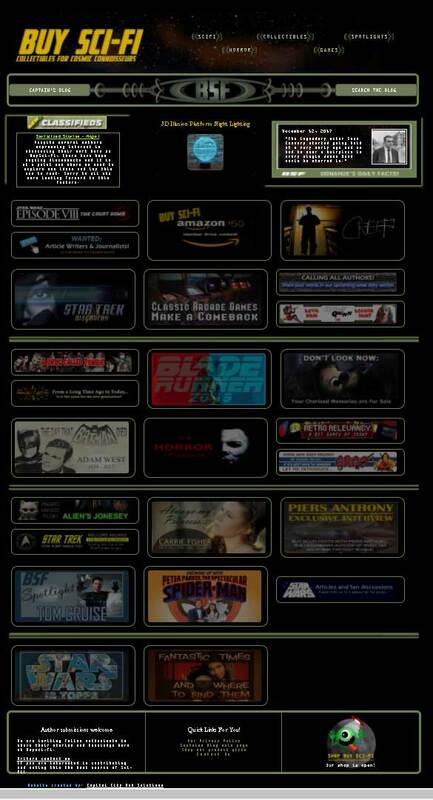 Here are a few websites we have worked on. Click the image for more information about that project. 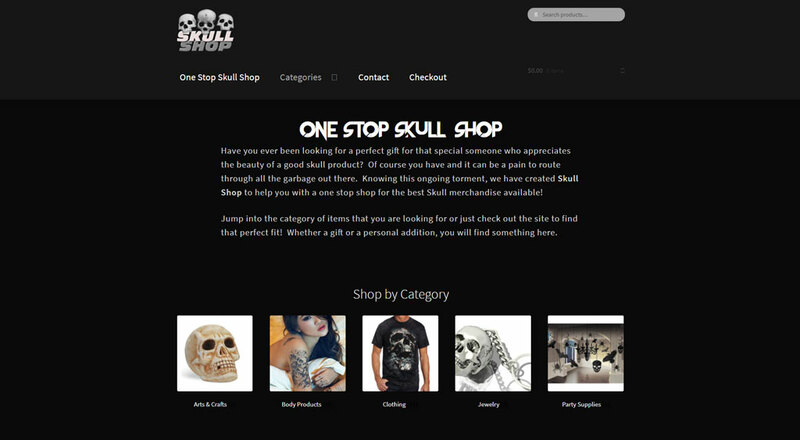 One Stop Skull Shop is a niche site for ... skulls! 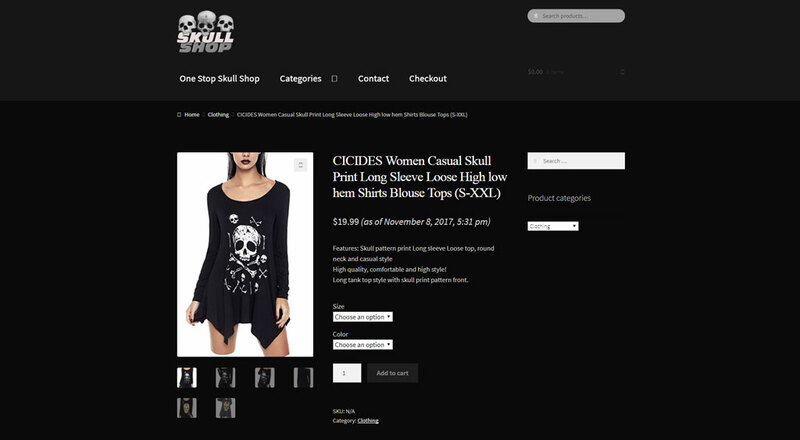 The site, which is still a work in progress finds all these related products that are selected from Amazon allowing you a one stop place to find that perfect product or gift for any skull enthusiast! 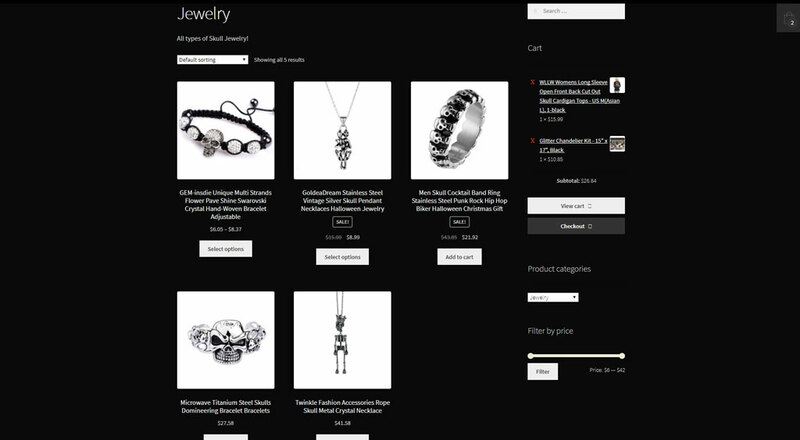 This site is built with WooCommerce and has all the features that Amazon has to showcase the product. 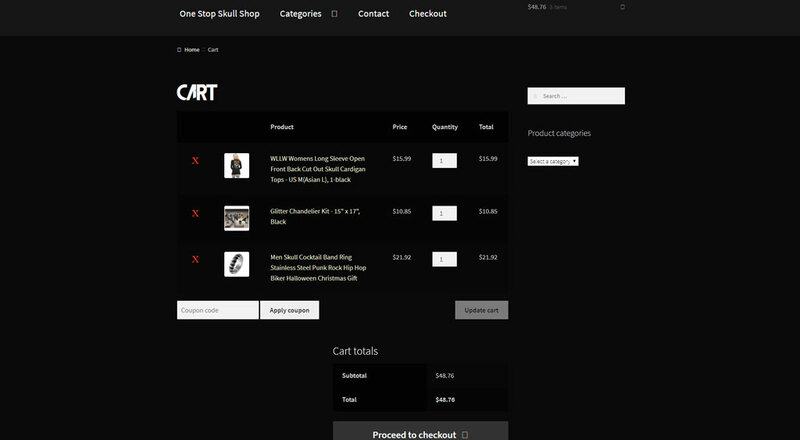 It allows the visitor to build up a shopping cart without leaving the site until ready to check out and then transfers to Amazon to make the purchase. 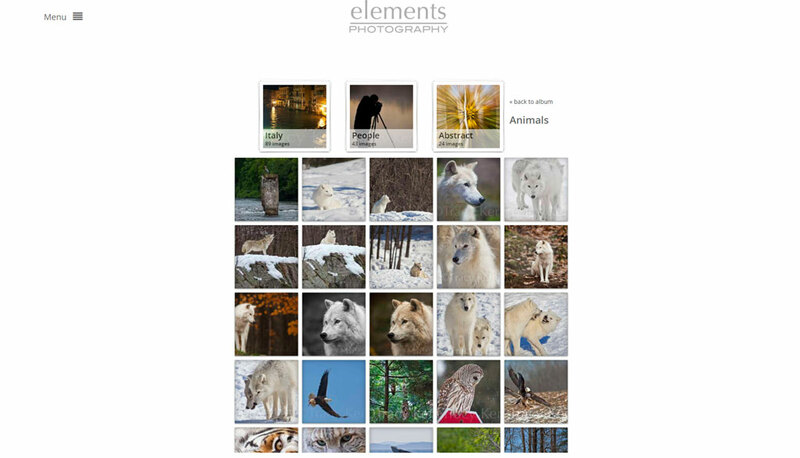 A fun and interesting theme to work with! 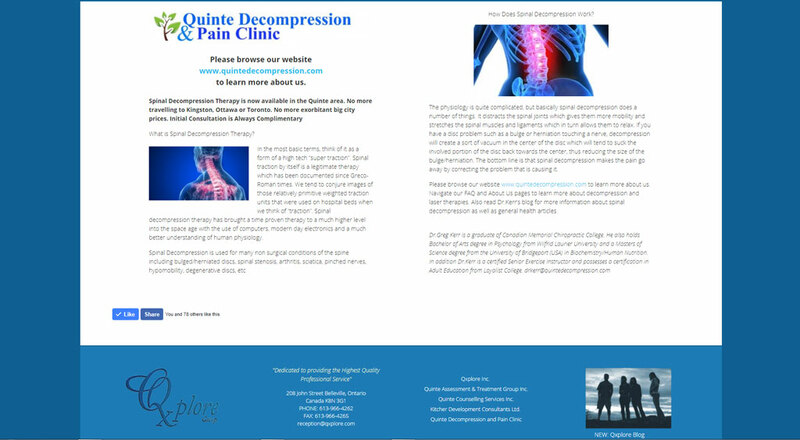 When we were contacted by Qxplore, they had a very outdated site that needed to update information, be available to the mobile market and also convert their quarterly newsletter from a pdf format into HTML. 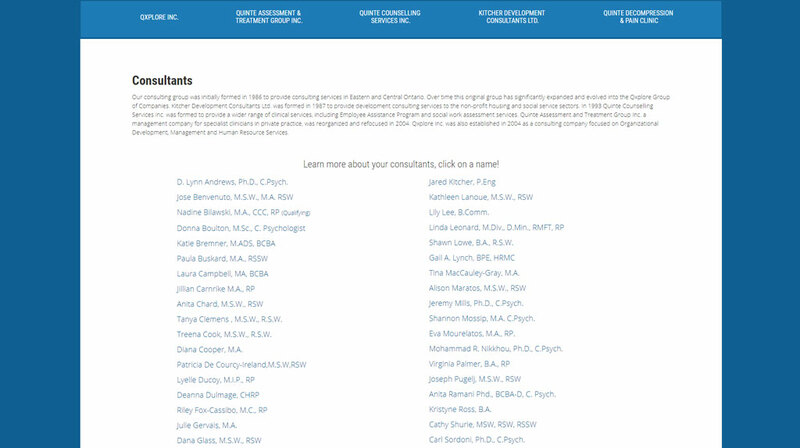 We took on this challenge and created over 200 pages including all the newsletters, branch information and all of the consultant biographies. 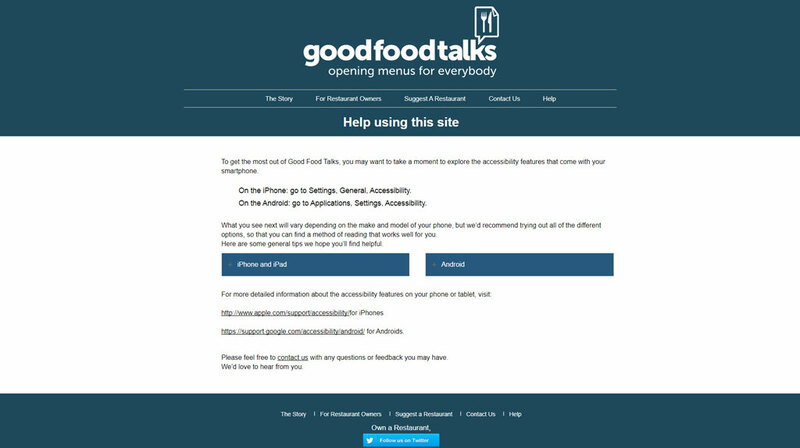 We needed to make a custom navigation for the ease of use in mobile sizes and a custom notification area in the header. 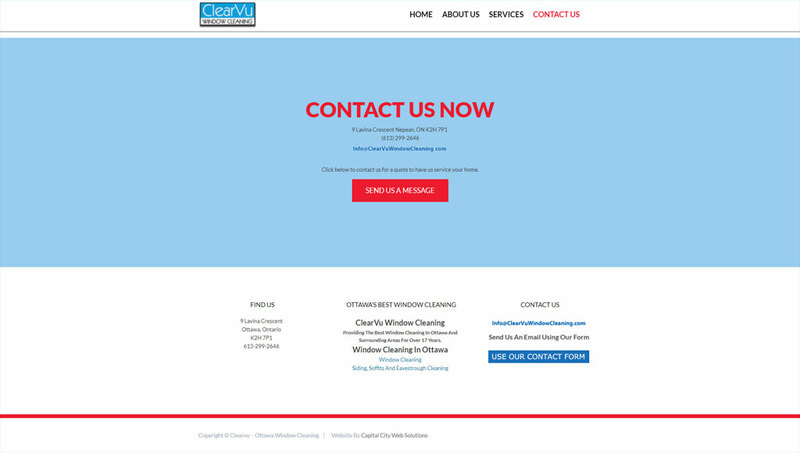 More recently, we were successful in bringing chosen subject matter onto the first page of Google after we completed a SEO audit and identified some opportunities that we implemented. 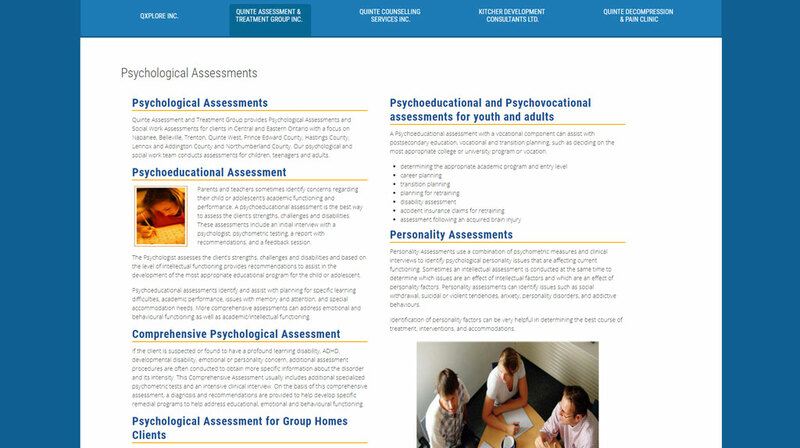 We have now included a new blog to the site where they are providing information in the area of both physical and mental health. 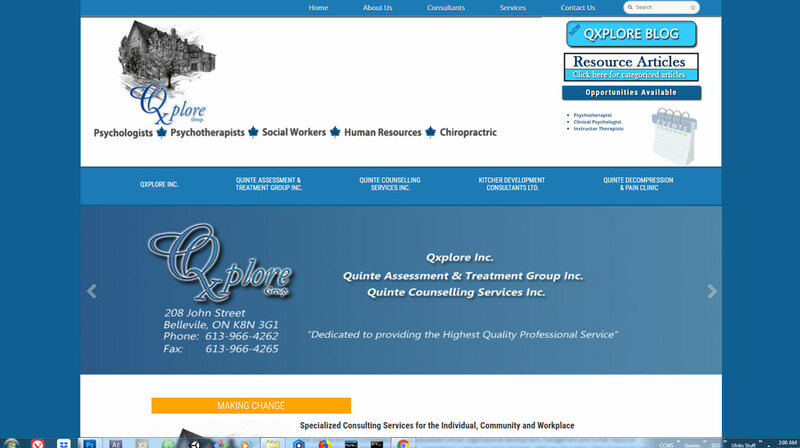 We are happy to continue to provide services for Qxplore. 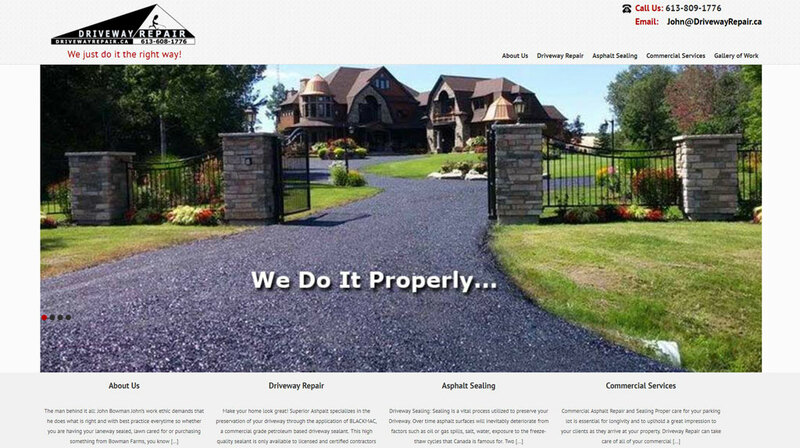 Ontario farmer, John Bowman, needed to promote his business of repairing and sealing driveways and use it to continue to grow his customer base. 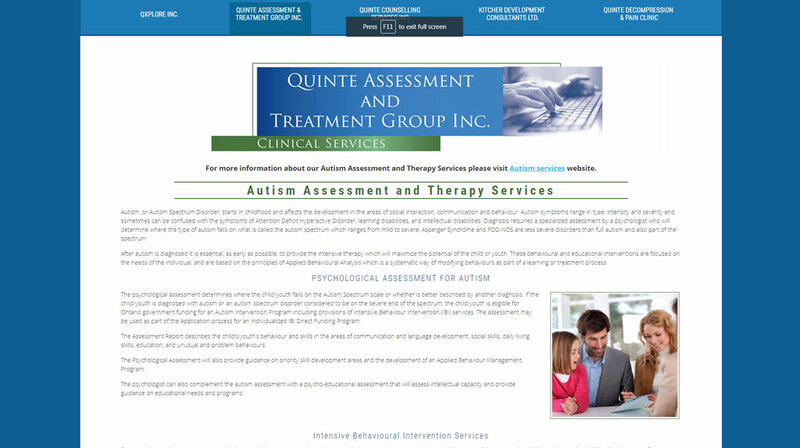 We set up a site so anyone searching for this service would immediately see the quality he provides. 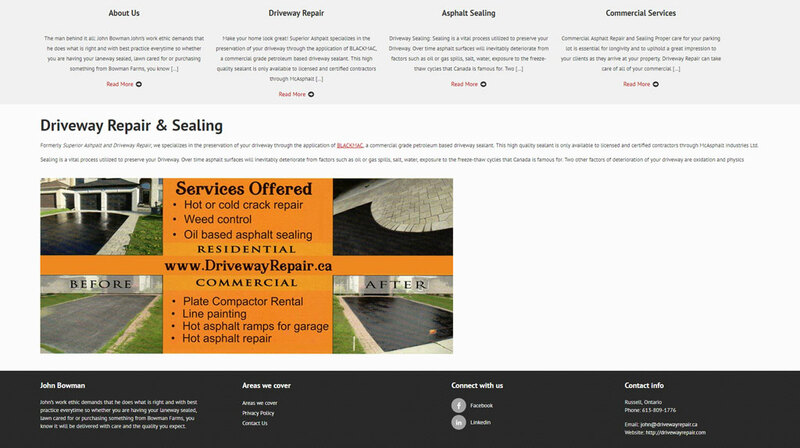 It is quickly learned there that he uses a superior sealant over the other services available, a clear map shows the areas he works in and you can easily contact him with a click of the button on every page. 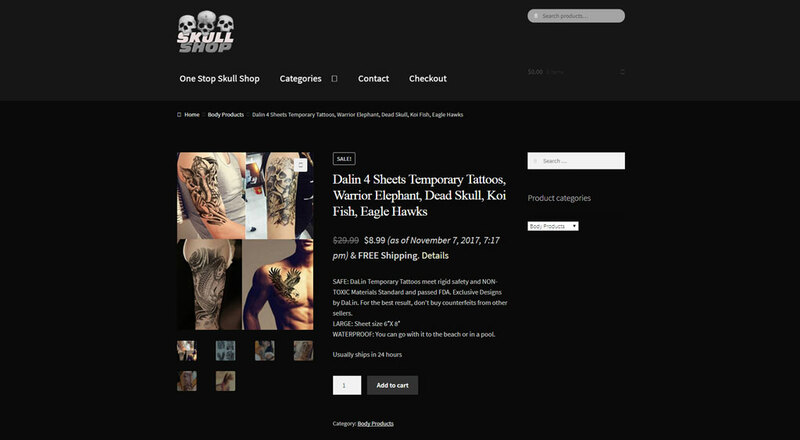 We also set up some social media sites to help bring even more awareness to his company. 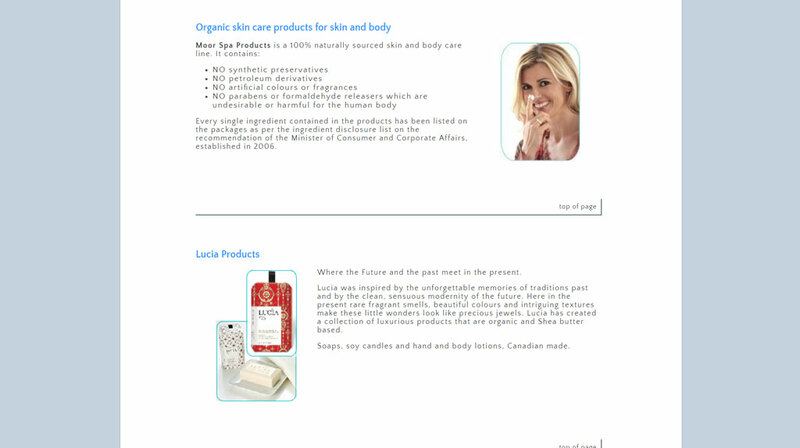 The company has become very successful and continues to grow. 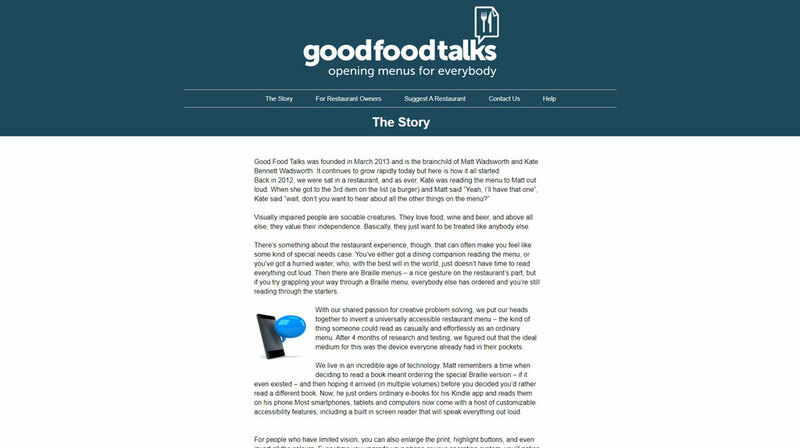 Good Food Talks, based out of the United Kingdom, came to us through a recommendation from a colleague who was doing related work with them. 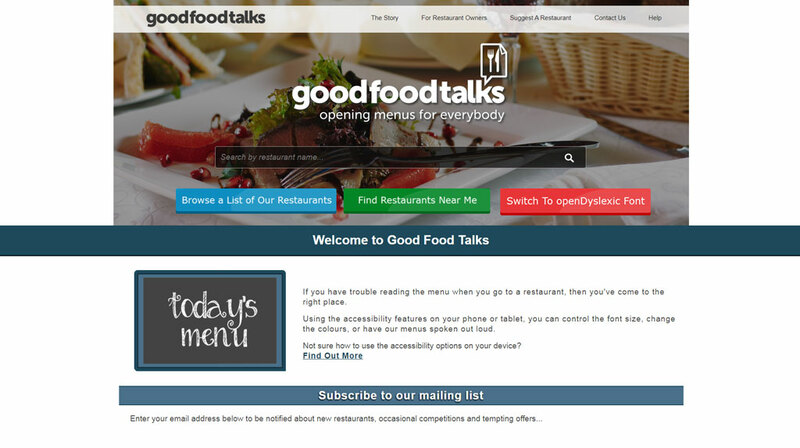 The owner had brought a great idea forward to assist the blind to easily learn what is on the menu of participating restaurants and was looking for a new cleaner website. 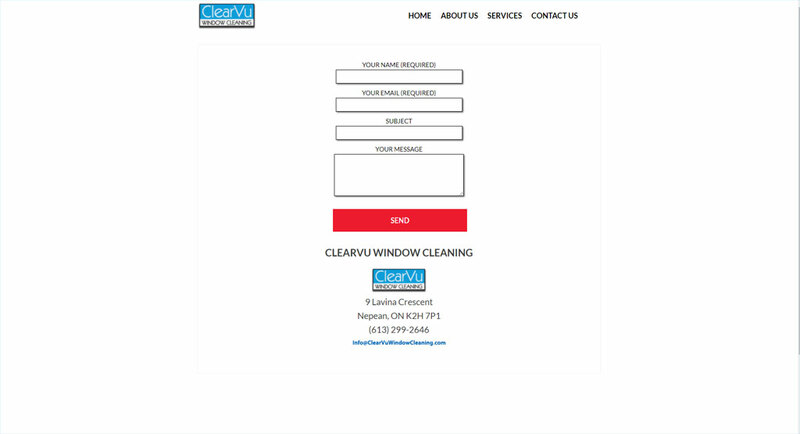 They had worked with another local company but finally decided that they were not getting the service they needed and this is where we came in. 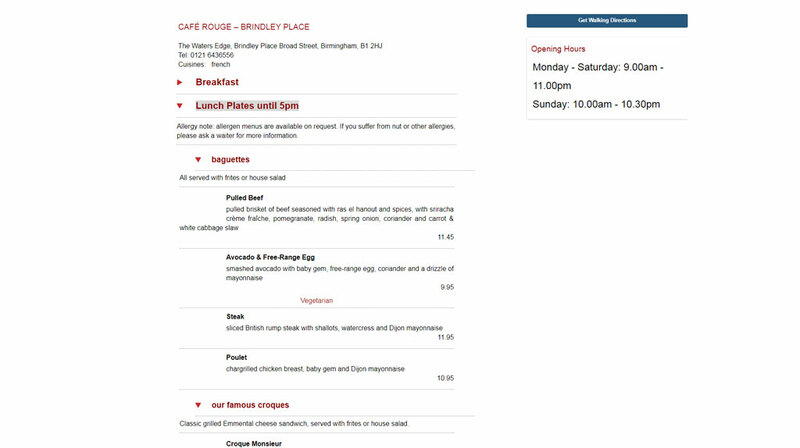 The concept of the site was to let the visually impaired users to search for a particular restaurant or browse nearby options and then easily cycle through the menus that were optimized for screen readers and accessibility options. This dream was founded by Matt and Kate Bennett Wadsworth back in 2013 and it was a pleasure to be a part of this great idea that continues to flourish. 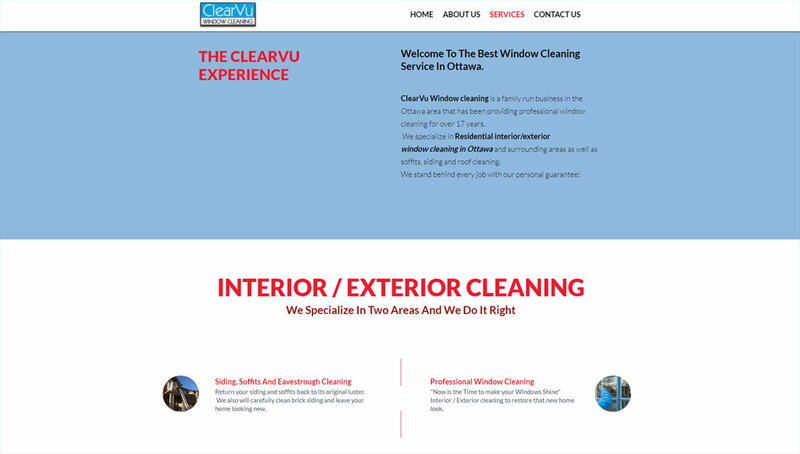 When we approached Sylvie Lapointe about upgrading her website, mostly to modernize it and allow it to start catering to the mobile market, we had an honest conversation regarding the issues I noticed and what it was that she wanted to bring the site. 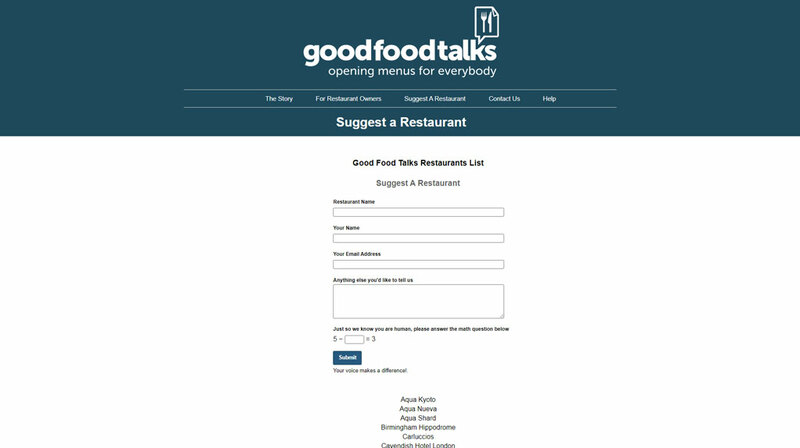 We worked out a plan and incorporated a blog called 'Ask the Expert' where she could provide some tips and tricks for her audience. 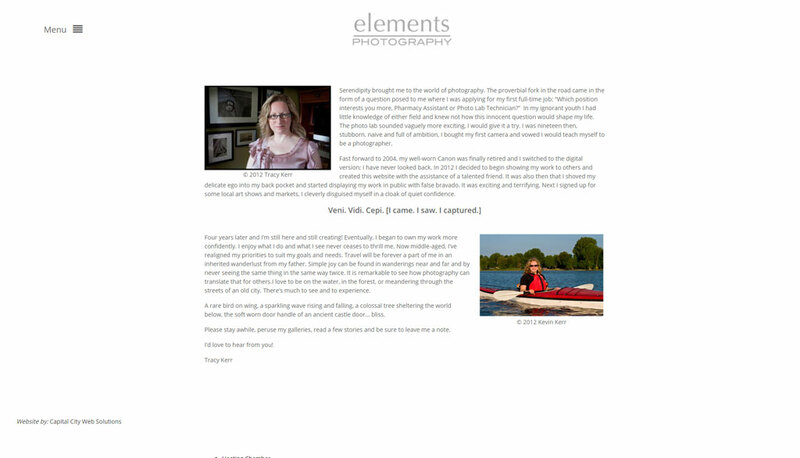 We also linked this website to her other online store that she was already running and focused on promoting visitors to sign up for her newsletters. 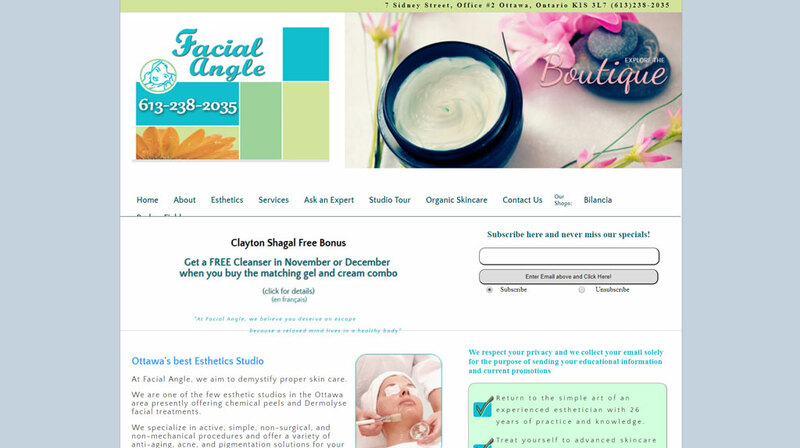 This has been very effective in growing her email list of clients. 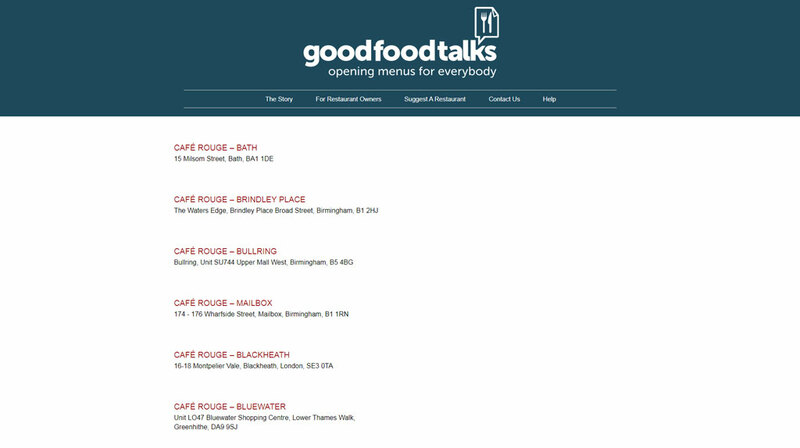 Sylvie has enjoyed success and it was a pleasure to work with her. 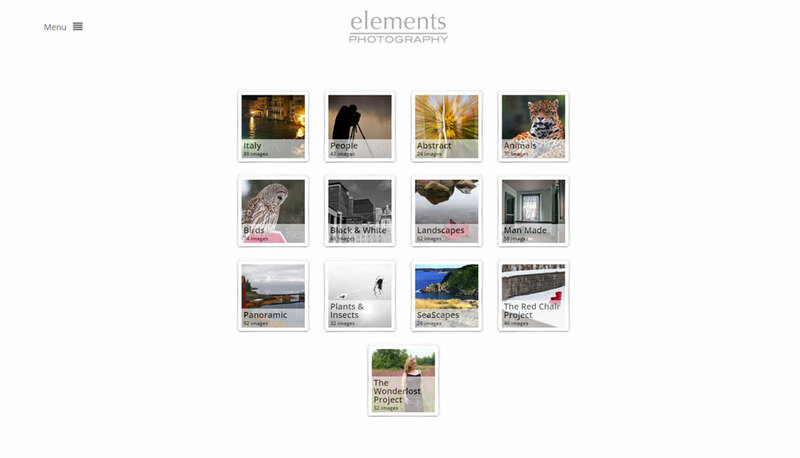 Tracy Kerr aka Elements Photography is a talented photographer who was wanting to post her work and later sell her photo prints and products online. 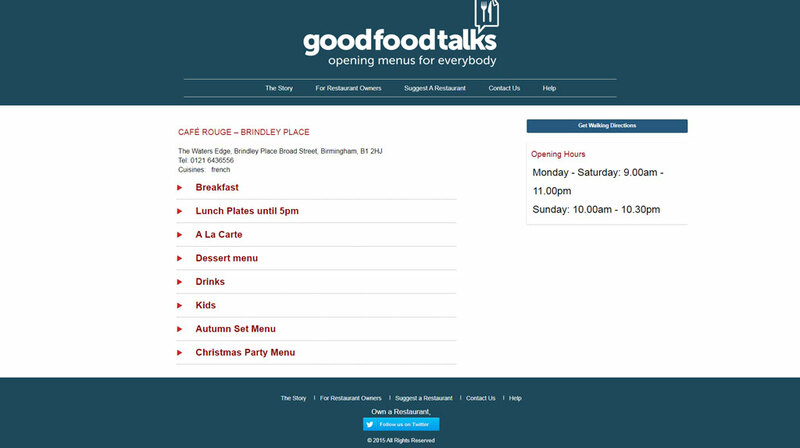 Enjoying a very clean and concise look, Tracy had a layout plan mapped out when we first spoke and we worked together to fine tune it. 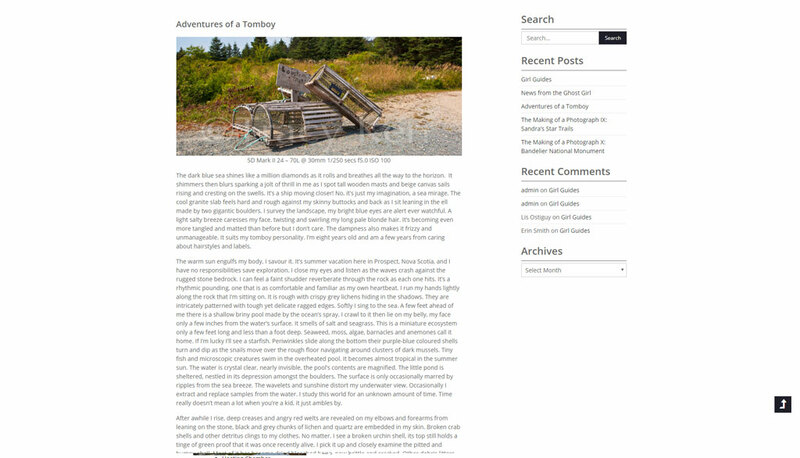 Along with the beautiful Gallery that breaks down the areas of her work, she also elected to include a blog where she could reach out to her fans and explain her work and interests. 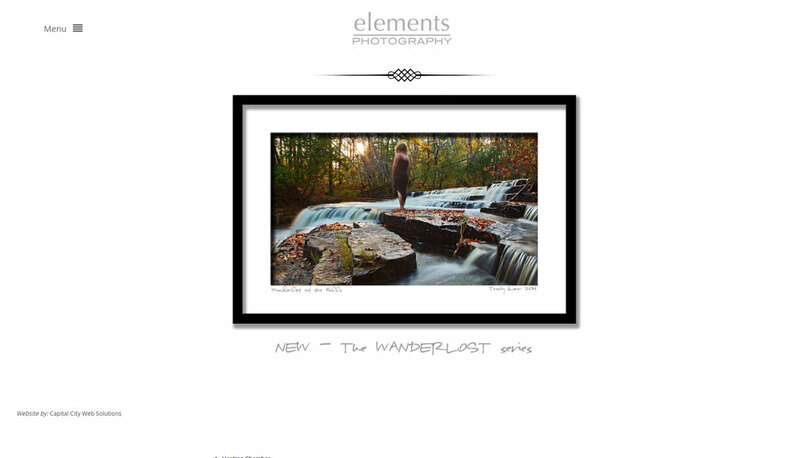 If you are interested in purchasing any prints or my recommendation for her calendars, please use the contact form and learn more! 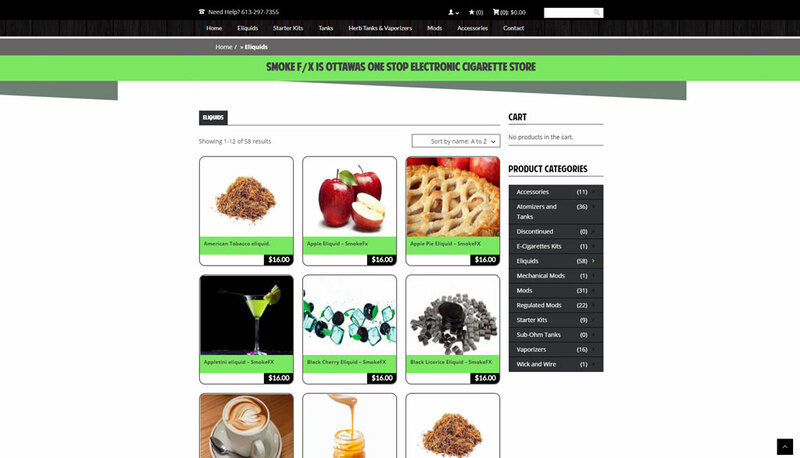 We started originally with SmokeFX back when they had only one store and no real presence online. 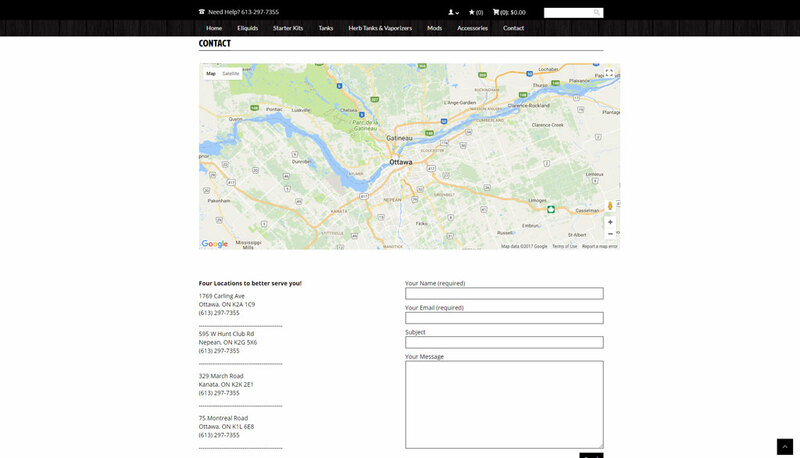 I would like to think that the successful online presence helped them grow and we are very happy that they now have four locations around Ottawa to serve you. 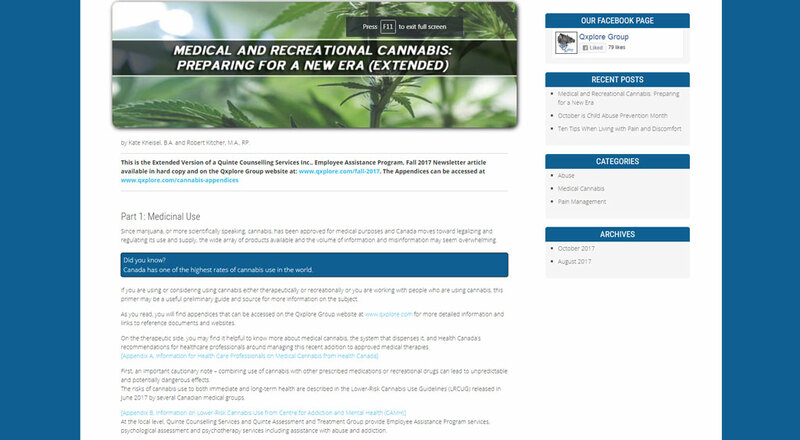 The site we originally set up ran for a couple of years but was replaced with the current eCommerce site by another web design company. 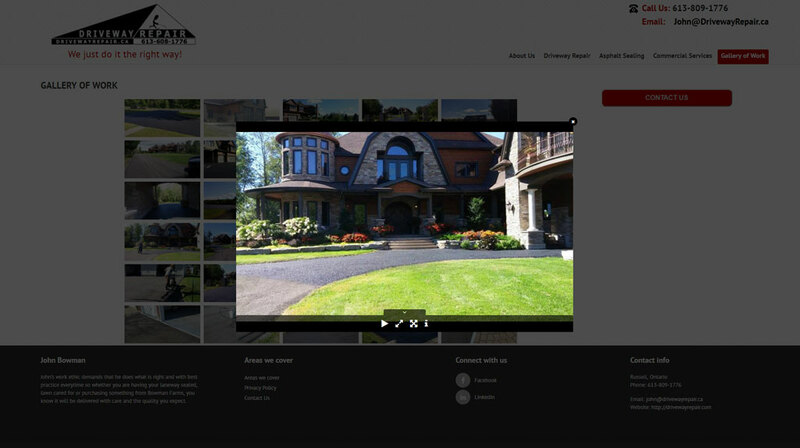 Although we were disappointed that the owners did chose to move to another design company, they soon returned to us when they ran into some issues and we were able to fix up the new site to their liking. 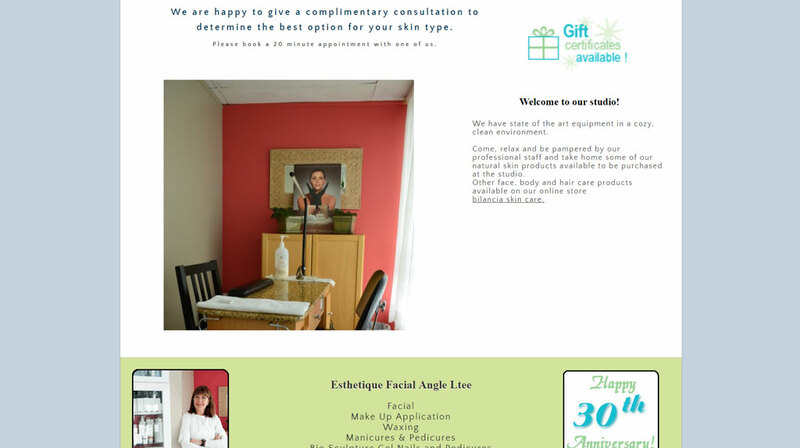 We have an ongoing relationship with them providing updates and promotional advertising as well as search engine optimization that has successfully pushed them ahead in the Google rankings. 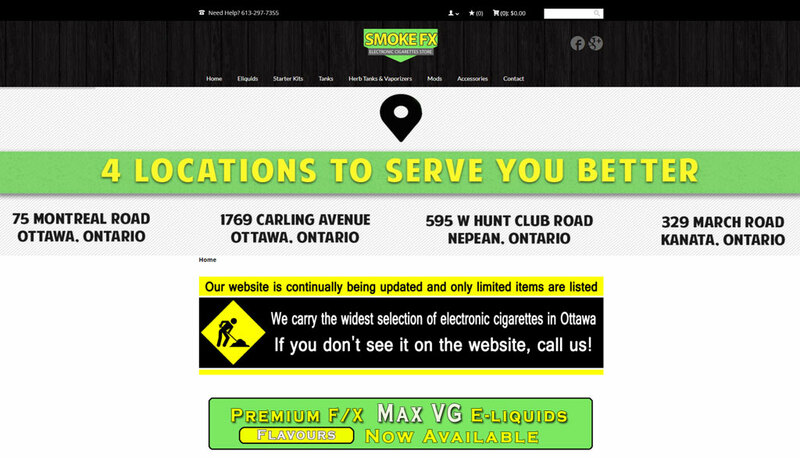 The owner of this site approached us needing a basic site to show their business they have run for 17 years but have never taken to the online market at all. 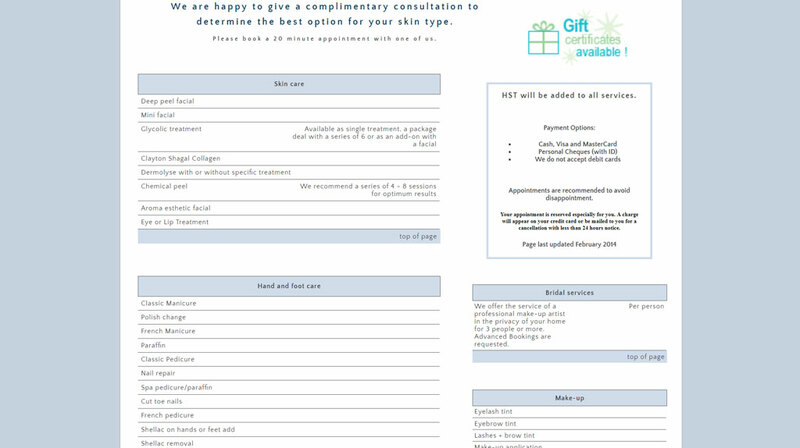 They wanted to just list the services they offered with a way for the public to contact them. 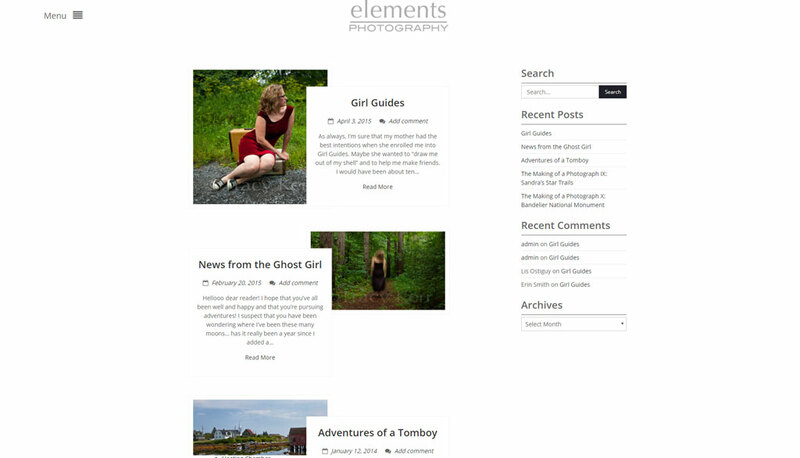 This was achieved using Wordpress with some customized images. 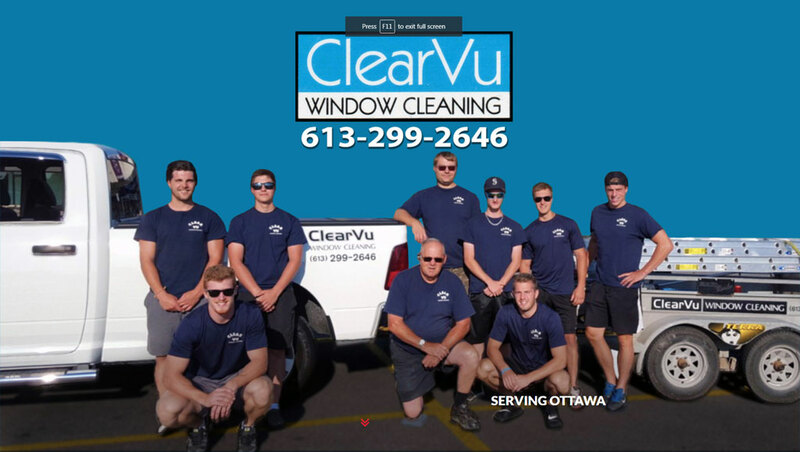 Despite the fact that SEO was not performed on the site outside of the initial keyword planning, ClearVu is found prominently on Google Map for the popular search term 'ottawa window cleaning' and has slowly increased ranking in the regular search. 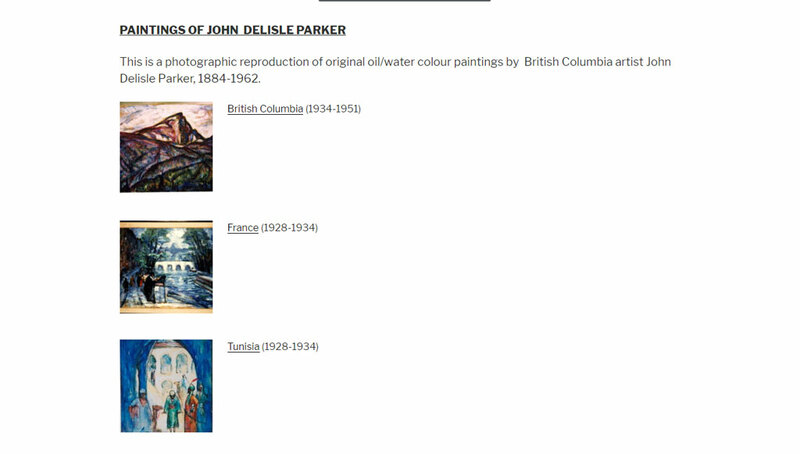 A Wordpress site to showcase the late artist John Delisle Parker. 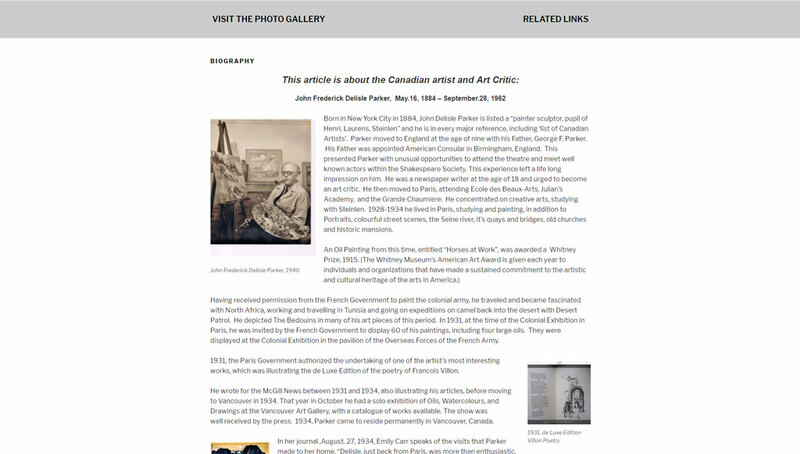 This project was spawned by a personal interest of a relative of John Parker who wanted to see his works available online for fans to enjoy. 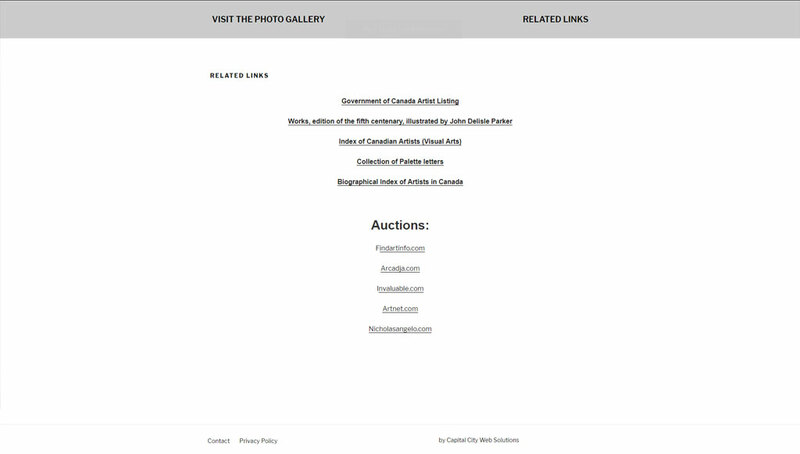 It is a smaller site that provides a biography, related links and a photo gallery of his work. 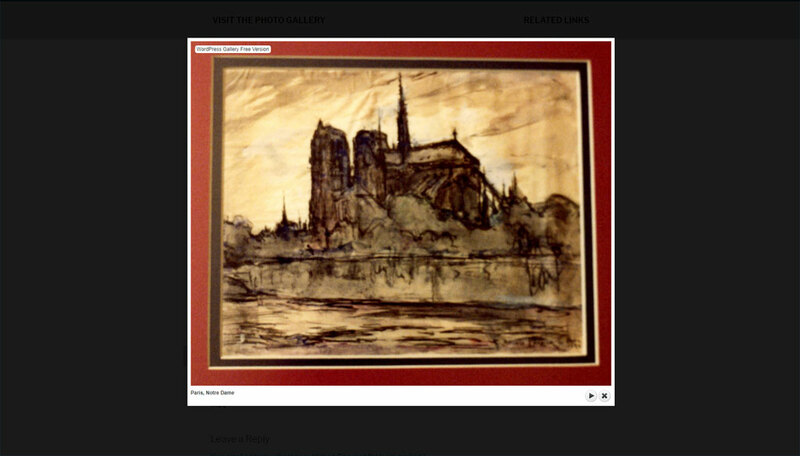 With only the initial planning for Search Engine Optimization, the site has made it way to the first page of Google for John Delisle Parker or artist search for John Parker. 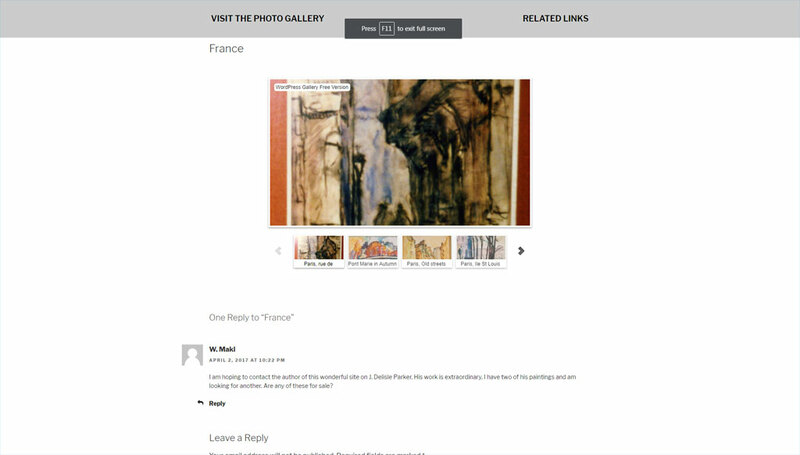 It was fantastic to hear that this site has connected the owner with a fan base who wish to set a gallery in his honour. 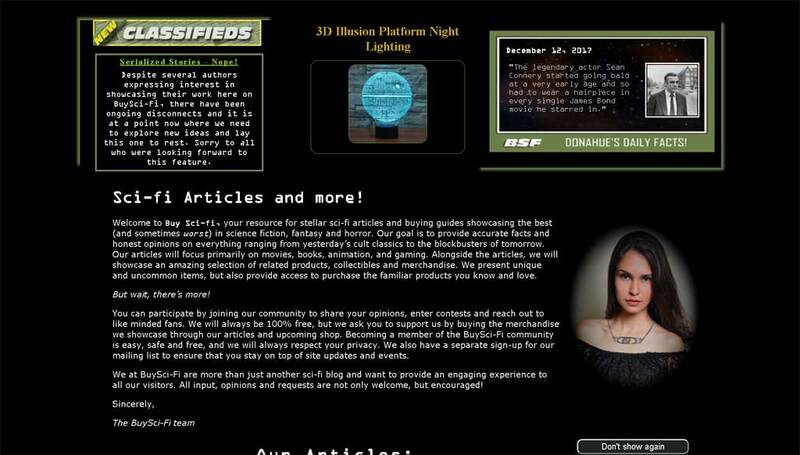 Captain's Blog is the article part of Buysci-fi and is made with Wordpress with a lot customized code. 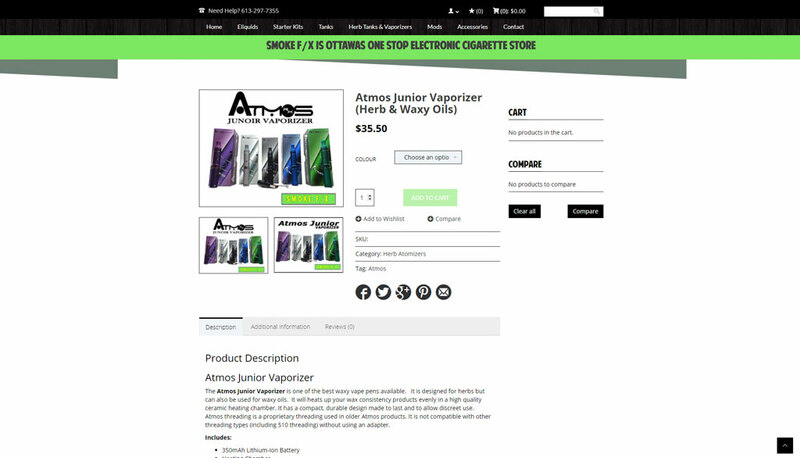 It followed the symmetrical layout of the parent site with graphical boxes showcasing the articles with the typical category navigation, search and login/register options in the sidebar to the right. 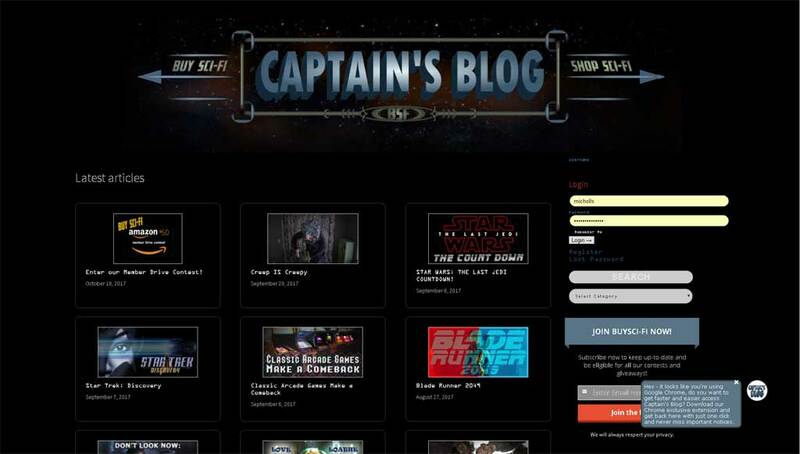 We added an option to subscribe to Captain's Blog's newsletter in the sidebar as well as promoting this with a pop up to reinforce the reader to join the network. 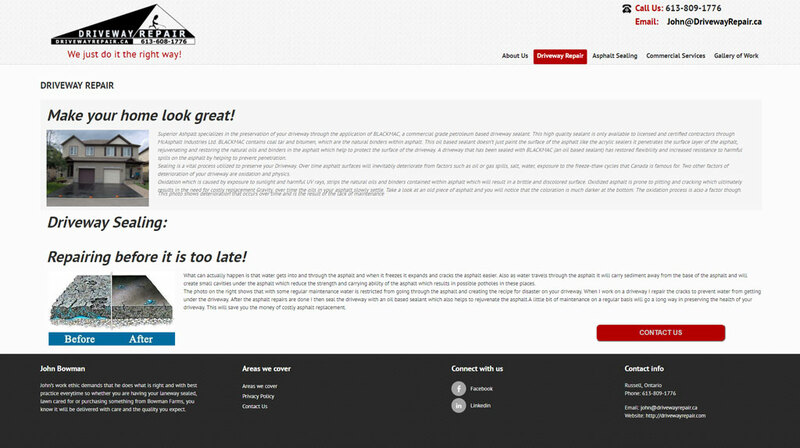 This subscription is also forwarded to a MailChimp account where the newsletter automation takes place. 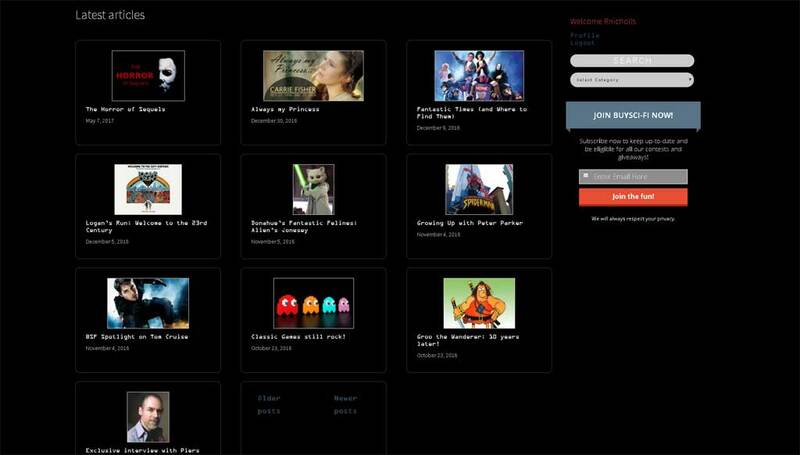 The new section coming up in the new year will be the ability to play Flash Games on the site. Various social media sites, including Facebook, Twitter, Google+ and Pinterest were created to bring awareness and announce new articles. 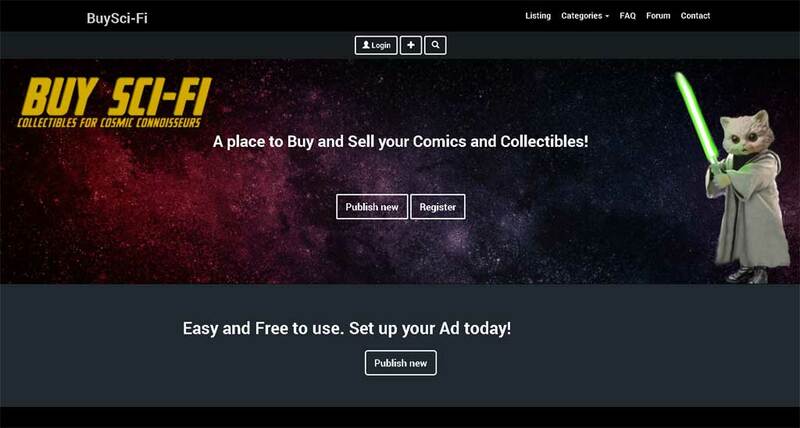 Facebook advertisements were also instrumental in promoting the site. 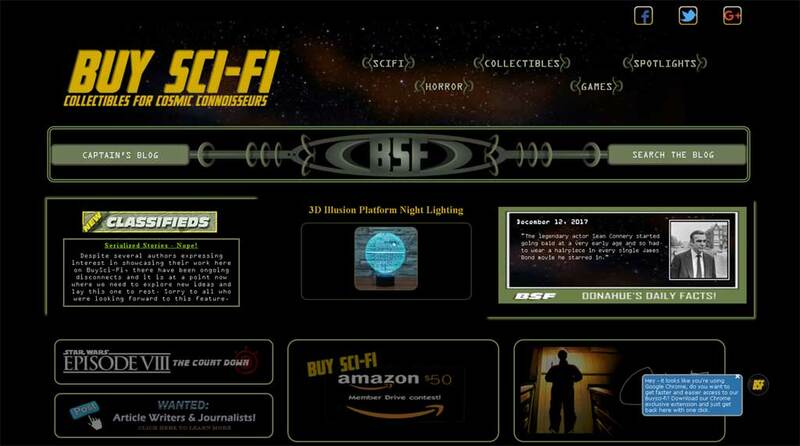 Buysci-fi is a science fiction niche site that has various articles, classified listing and a forum. 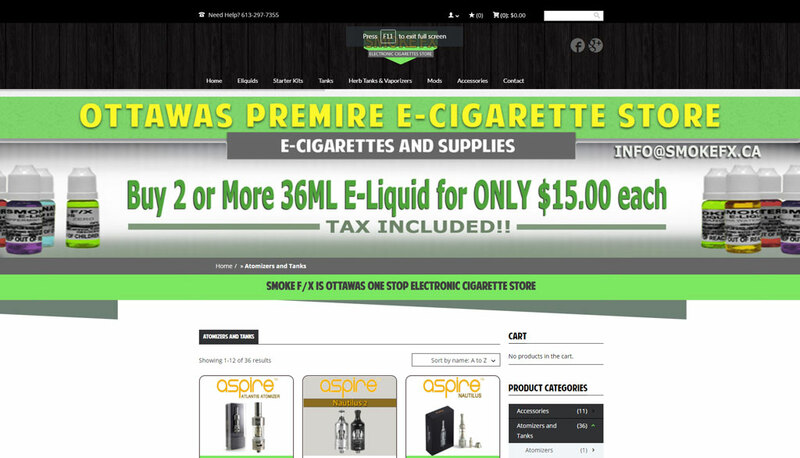 An information bar for announcements, related rotating (affiliate) products from Amazon and "Donahue's Daily Facts". 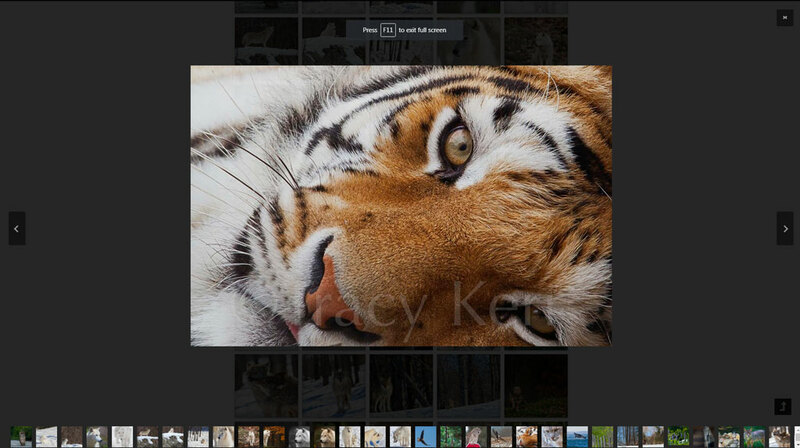 The daily facts had a custom editor created to easily find, add, edit and delete facts and upload the images. 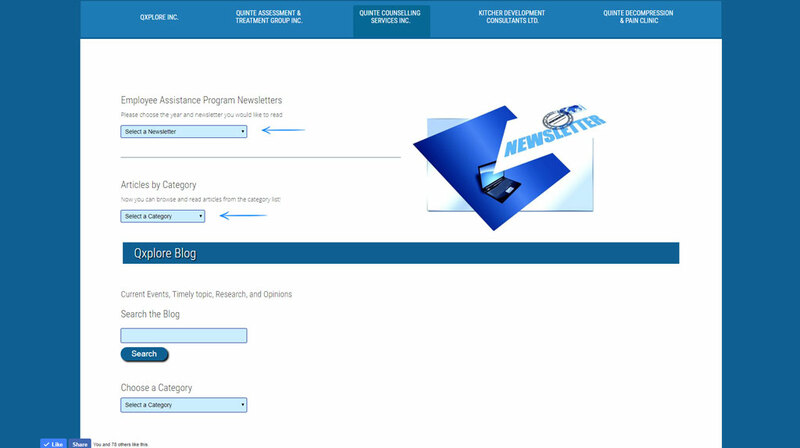 There is a direct link to Captain's Blog and a search box to find the article subject you are looking for. 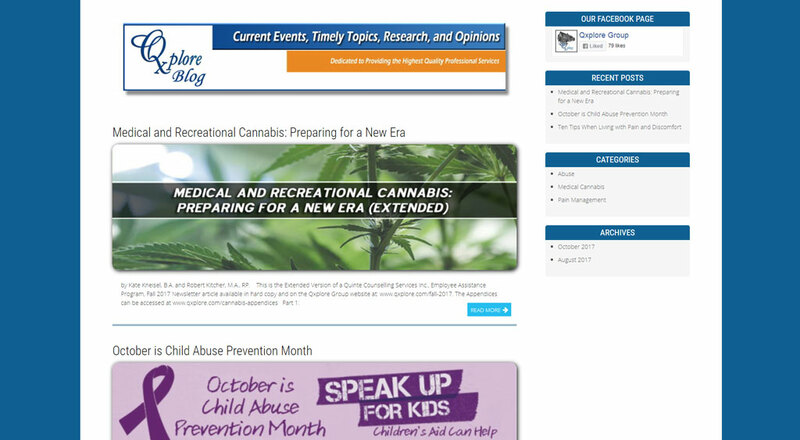 For the articles, we created a custom class where the images below target the specific article it represents and links to it. 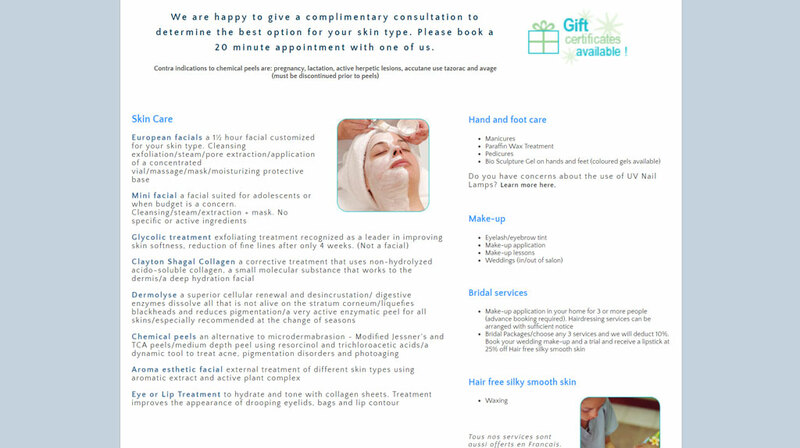 The design of the page obviously had to have a futuristic feel but with clear and easy navigation and this was achieved using custom graphics and symmetrical boxing.